← Has It Been A Whole Year? I n the past a few lake residents have attempted to get the community in the mood for the upcoming July 4th weekend celebrations a small group of determined boaters took a lap around the lake sporting patriotic decor. 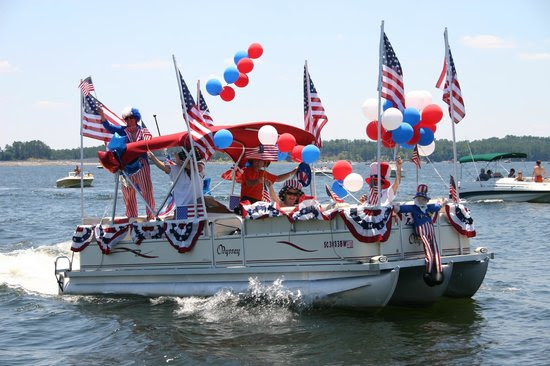 Long time residents on the lake remember 4th of July boat parades drawing large numbers. We’ve decided to make this a formal annual tradition, so please join us for this fun neighborhood event! To make the weekend complete the DLNA will be leading a Boat parade on the 3rd of July beginning in front of Regatta Park at 7pm. Deck you boat with patriotic fare and gather at Regatta Park and take a lap around the lake to celebrate this great country.